We all live in a watershed. If you are reading this website, you likely reside in Southeastern Wisconsin, where the Greater Milwaukee River Watersheds and the Root-Pike Basin Watersheds wind their way to Lake Michigan. While our rivers and Lake Michigan are much healthier than they were 10 years ago, they still face major challenges. One of the major dangers to the health of our water is non-point pollution that is carried by stormwater and snow melt. Non-point pollution is harder to control than other forms because it cannot be linked to a single source, or point. Instead, non-point pollution comes from all of us -- from our yards, driveways, cars, farms, stormwater, and snowmelt. Non-point pollution cannot be solved by building new treatment plants or constructing a new sewage system -- it requires community action. 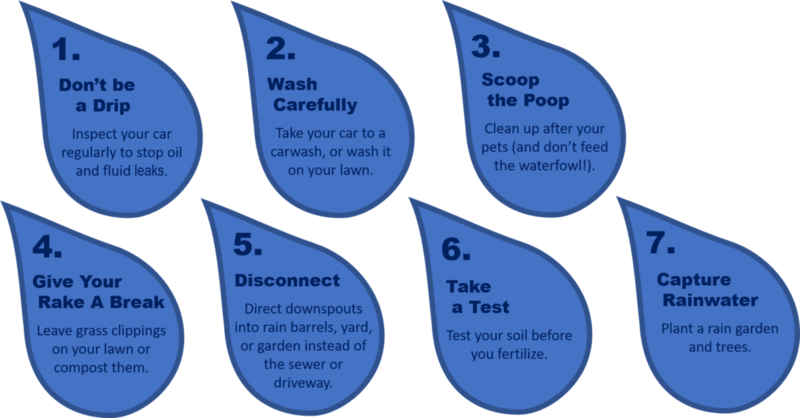 Every time it rains, anything left on a sidewalk, lawn, or street ends up in storm sewers that flow directly into our rivers and Lake Michigan -- the source of the water you drink every day. Each of us can have a positive impact on the health of our rivers and Lake Michigan. Maybe you’re thinking that you’re just one person -- and that’s right -- but if we each do our part, all our individual actions will add up. So, let’s start together, in our own homes, and help to protect our rivers and Lake Michigan! So what can you do? Start with one of the seven simple tips from Sparkles.